The January 2009 Theme Day is Best Photo of 2008. Like any other theme day, the theme is open to interpretation. I chose to publish what I thought was my best photo of the year, regardless of location. 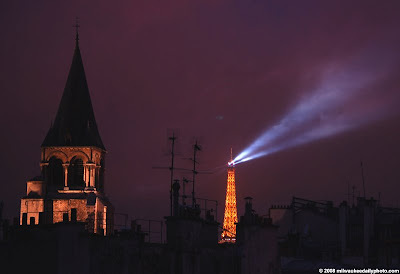 This photo of the Eiffel Tower was taken on May 24th, late in the evening, from the rooftop of our apartment in the 6th arrondisement in Paris (for those interested, it was on the corner of the Rue de Seine and Rue de Buci, above the Bar du Marche). We were packing and preparing to leave Paris to return to Milwaukee from our honeymoon. As I did not have a remote trigger for the camera, I had to use the self-timer to trigger the shutter, and guess when to start the timer to get the searchlights in the frame to achieve this affect. It took me about 15 tries to get it right, but I was very pleased with the result. In the foreground of the picture on the left is the belltower of the St Germain de Pres church. It was the last photo I took on the trip. It's a beauty . . . such resourcefulness and patience. Happy New Year! A gorgeous photo. The photo is perfect for theme day. Happy new year! I hope you have a fantastic 2009 with plenty of Eiffel Tower opportunities!